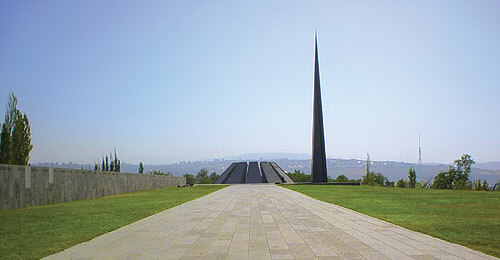 Tsitsernakaberd Memorial Complex in Yerevan is dedicated to the memory of the 1.5 million Armenians who perished in the first genocide of the 20th century, at the hands of the Turkish government. Completed in 1967, the Genocide Monument has since become a pilgrimage site and an integral part of YerevanвЂ™s architecture. 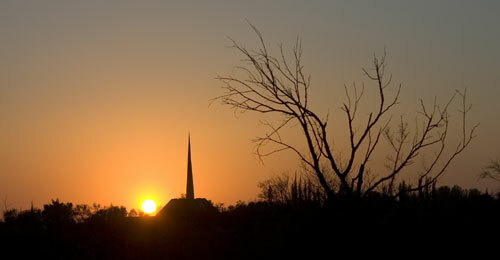 Set high on a hill, dominating the landscape, it is in perfect harmony with its surroundings. The austere outlines convey the spirit of the nation that survived a ruthless campaign of extermination. Before reaching the central part of the monument, visitors first observe a 100-meter long basalt Memorial Wall with the names of cities engraved in stone. The names also include the Armenian populations that were massacred by Turks during the Genocide campaign. Since 1996, the last portion of the Memorial Wall houses glass casings that contain soil taken from the tombs of political, and intellectual figures who raised their protest against the Genocide committed against the Armenians by the Turks. 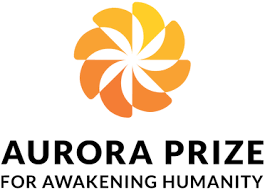 Among them are Armin Wegner, Hedvig Bull, Henry Morgenthau, Franz Werfel, Yohannes Lepsius, James Bryce, Anatol France, Jakomo Gorini, Benedict XV, Fritioff Nansen, Fayez El Husseyn. As part of the monument, an arrow-shaped stele of granite, 44 meters high, reaches to the sky, symbolizing the survival and spiritual rebirth of the Armenian people. Partly split vertically by a deep crevice, this tower symbolizes the tragic and violent dispersion of the Armenian people, and at the same time, expresses the unity of the Armenian people. At the center of the Monument stands the circular Memorial Sanctuary. Its unroofed walls consist of twelve, tall, inward-leaning basalt slabs forming a circle. The shape of these walls simulates traditional Armenian khatchkars, which are stone slabs with large carved crosses at the center. These slabs also suggest figures in mourning. The level of the floor of the Genocide Monument is set at one and a half meters lower than the walkway. At its center, there is an eternal flame which memorializes all the victims of the Genocide. The steps leading down to the eternal flame are steep, thus requiring visitors to bow their heads reverently as they descend. From 1988-1990 the Khatchkars (Cross-Stones) were mounted in the vicinity of the Genocide Monument to commemorate Armenians massacred in the 1980s by the Azeri government, in the Azerbaijani cities of Sumgait, Kirovabad (Ganzak) and Baku. In 1995, the Museum and Institute (architects S. Kalashyan, L. Mkrtchyan, A. Tarkhanyan, sculptor F. Arakelyan) was built near Tsisernakaberd to commemorate the 80th anniversary of the Armenian Genocide. 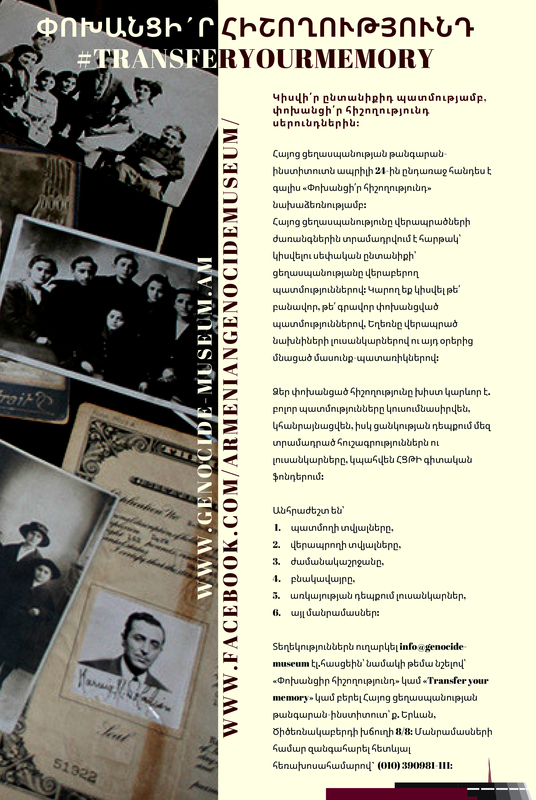 Today, the Museum & Institute functions as a research center within the Armenian National Academy of Sciences. Under the Soviet rule, when it was prohibited and unacceptable to practice a national ideology, the commemoration of the Armenian Genocide and the inspiration of the victimsвЂ™ memory were compelled to silence. In 1965, the Soviet Armenian population demanded that a memorial monument be constructed, because Armenians in other countries had already commemorated the fiftieth anniversary of the Genocide. On April 24th, massive demonstrations were organized in the central squares of the Soviet Armenian cities as well as in Yerevan. 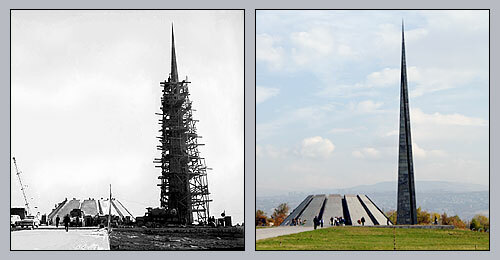 Encouraged by public demand, on March 16, 1965 the Soviet-Armenian Government decided to build a monument eternalizing the memory of the victims of the Genocide. The efforts of people like Yakov Zaroubyan (First Secretary), who made every attempt possible to sway MoscowвЂ™s resistance, was made evident by the approval of the project. Before the construction of the memorial, the Armenian nation had been honoring the memory of the victims of the Armenian Genocide by visiting the Pantheon in the Komitas Garden. However, thousands of people have marched in the direction of Tsitsernakaberd memorial since 1967. 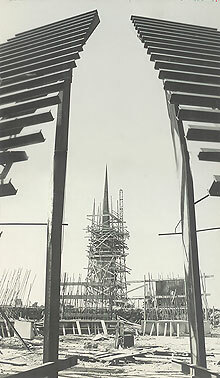 In April 1965, a nation-wide competition was announced in Armenia to create the best and most representative memorial design. The announcement read as follows: The obelisk must embody the creative Armenian nationвЂ™s life that has been full of struggle, its inexhaustible vitality to survive, the progress it has made as well as representing its present and the bright future while eternalizing the memory of millions of victims of the Genocide of 1915. 69 participants (both diasporan and local architects) took part in the competition. 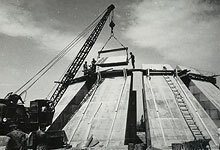 They each submitted their projects under code names like вЂњJayrвЂќ,вЂќPyunikвЂќ,вЂќ MoushвЂќ,вЂќ GhoghandjвЂќ, вЂќKrakвЂќ, вЂњKarmir Tsaghik.вЂќ The winning projectвЂ™s codename was вЂњArmenia SSR droshakвЂќ and architects were Arthur Tarkhanyan and Sashur Kalashyan were chosen as the successful bidders. Each of the architects were awarded 100 Soviet rubles. The winning architects were able to choose the location of the monument and during the excavation process to set up the foundation for the memorial, many relics from the bronze era were uncovered in the bassalt. 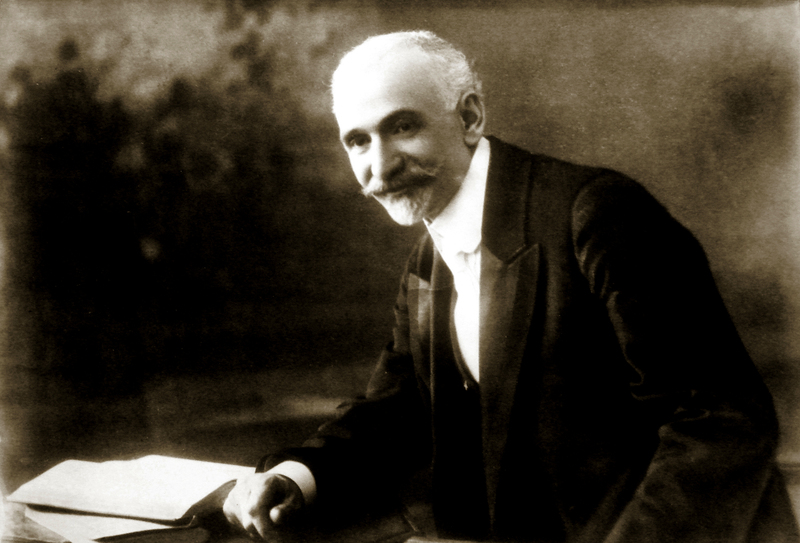 Chief builder, Artavazd Ordukhanyan, was also the head of вЂњErchemshintrestвЂќ and had his budget set at 400,000 Rubles. The ceremonial opening of the obelisk, which took place on November 29, 1967, on the 47th anniversary of Soviet Armenia, became a significant socio-political event. The heads of the Government, A. Kochinyan, N. Haroutunyan, G. Ter-Ghazaryan, R. Khachatryan, L. Gharibjanyan alongside thousands of locals gathered at the top the hill at Tsitsernakaberd to commemorate the memory of the victims of the Armenian Genocide. The ceremonial walk to the memorial continued late into the night. Since 1967, every year on April 24 thousands of people have visited Tsitsernakaberd Memorial Complex, with numbers increasing every year.